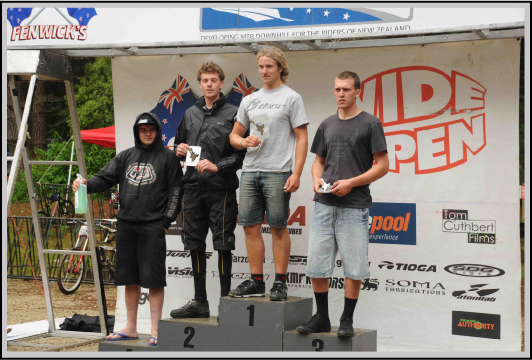 New Zealand Downhill Series – Final Round 6: Whakarewarewa Forest – Rotorua. 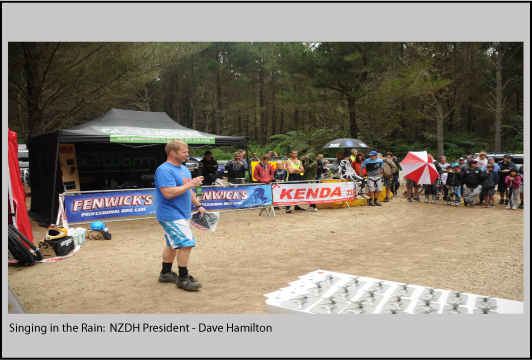 The final Round 6 of the NZDH series venue was transferred to Rotorua from Tauranga due to new land ownership issues with the Tauranga Cycle Obsession MTB Park. Once again with the threat of rain for the mid week ( between Christmas and New Years day ) event, rider participants were a little down with parents of the younger classes deciding it was time for the beach holiday instead. 90 Riders registered for the mid week event with the both days pretty much escaping the threatening rain storm that was on its way to the Bay of Plenty. Pro Elite Winner – Matthew Walker. Considering rain had been forecasted again for both practice and race days for the Bay of Plenty, apart from a few heavy showers on Thursday’s race day, the weather was perfect! 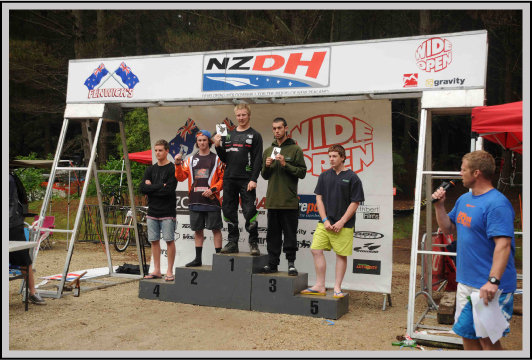 After a final decision from the team of the Cycle Obsession MTB Park in Tauranga to transfer the final NZDH event to Rotorua, the riders were greeted with a new section to the well renown Rotorua National Downhill track for them to become familiar with over the two day mid week event. The practice day once again went very smooth throughout, with the newly formed NZDH practice day format of having a timed seeding session held between 3.00 – 4.30pm where all competitors can slot in their best timed practice run for starting order rights within their respective classes. The Monster Energy team riders of Louis Hamilton and Richard Leacock were the fastest men of the timed sessions with Louis posting an outstanding 3m.10.26 which gave him a full 5sec advantage over his team mate and his seeding time was never beaten throughout the whole event! The morning’s weather was full of threat of the final round Race Day being a complete washout, a heavy shower greeted the arrival of the competitors and spectators but as the day rolled on, the showers disappeared throughout the early morning practice session right through to the final race runs. 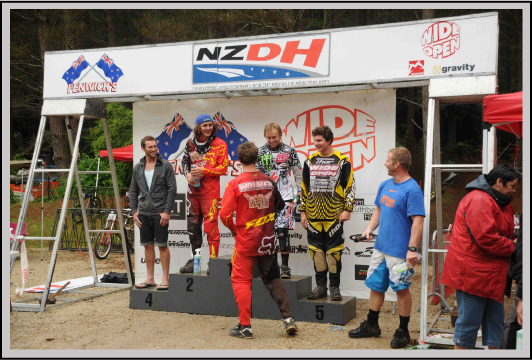 Once again, it was a repeat scenario of the very 1st round of the NZDH series here in Rotorua back in Sept where if the riders didn’t have the race run they were looking for, the track conditions were less than ideal to try and beat the 1st race run times. An early lunch break, the riders prepared themselves for the final round race runs with the first rider shuttles left for the top of the track at 12.00pm sharp. Even though the competitor numbers were down a little, the race day atmosphere was great due to quite a few newly formed teams showing off their new “war paint” in preparation for the up and coming Summer National MTBNZ series kicking off in Queenstown this weekend. It was also great to see Mr Wyn Masters competing for the 1st time since recovering from a “long winded” forearm injury which effectively put a stop to his International 2011 World Cup campaign season. 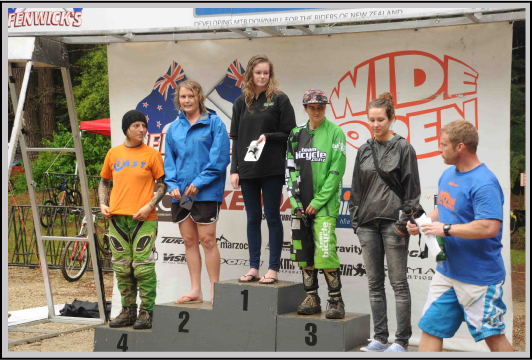 Overall the days racing was as exciting as ever and the Rotorua National Downhill track was always a good challenge for all competitors involved, being that it is the highest and longest race track of the series. The highlight of the day was the Pro Elite class final runs where Mr Matthew Walker totally stamped his authority on the field with a 3sec advantage over Wyn Masters and Richard Leacock to take the series title. Race and series results in previous post below this article. Photos below of respective class series podiums. 1st: Simon Fugle 2nd: Darren Doell 3rd: Nick Skeates 4th: Leon Duggan 5th: Bennett Gage-Brown. 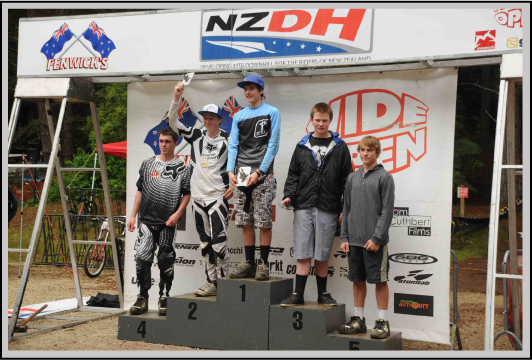 NZDH 2011 Men Under19 Class Overall. NZDH 2011 Senior Men Class Overall. 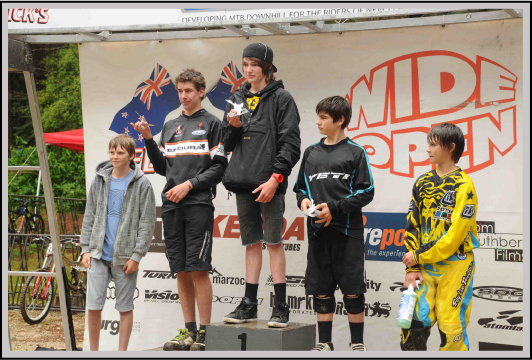 NZDH 2011 Pro Elite Class Overall. 1st: Matthew Walker 2nd: Hayden Lee 3rd Daniel Melink 4th: Stefan Gardner 5th: Daniel Heads. 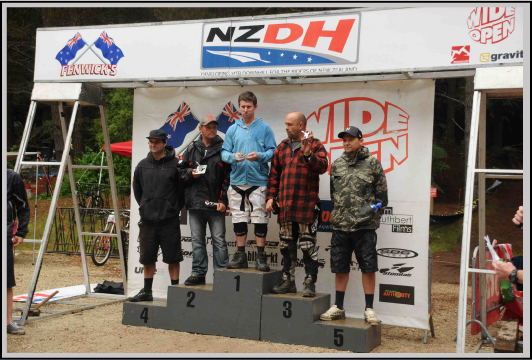 The 2011 NZDH series was an outstanding success of which would not have possible without the support of all the riders/competitors that competed. The NZDH crew were absolutely wrapt with the support you have all shown and making the series a big success that it all turned out to be. Thanks Again and all the best for the MTBNZ Summer National Series. 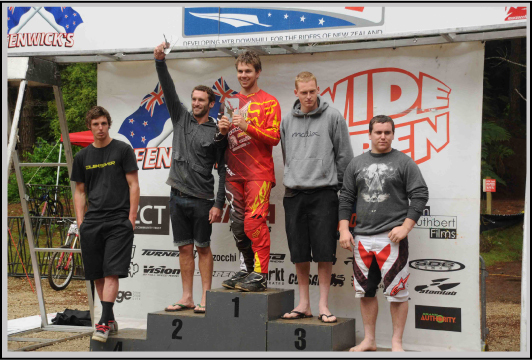 Hopefully we have achieved support and recognition of your brands and products through this period and the future within the New Zealand Downhill Contingency. I will be in touch on a personal note very soon. This entry was posted on Friday, January 6th, 2012 at 8:51 am and is filed under Uncategorized. You can follow any responses to this entry through the RSS 2.0 feed. Both comments and pings are currently closed.